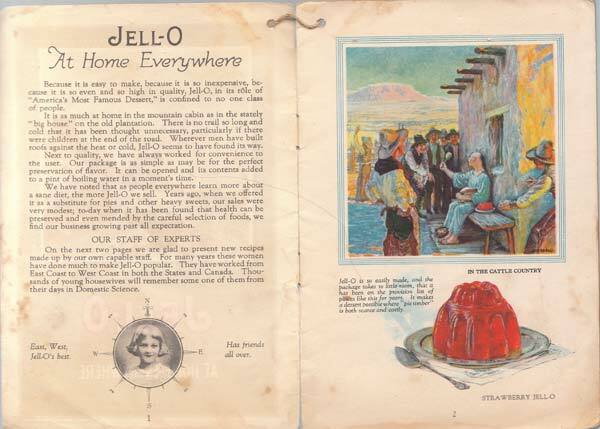 The recipe for Glorified Rice comes from the earliest Jell-O ephemera in my collection: Jell-O, America’s Most Famous Dessert, At Home Everywhere published in 1922. Watch out! That bear is about to get all up in your Jell-o! It’s the grand tour of Jell-O. It’s kind of cute, because it’s playing off American’s increasing desire to explore their country. With the growing popularity of the car and continental railroads criss-crossing the land, there was less and less of America that was inaccessible to the average citizen. Additionally, Jell-O’s advertising bread and butter at this time were pastoral oil paintings, scenes of everyday life from across the nation, of a fine enough quality that they were displayed in galleries and museums everywhere (allegedly). 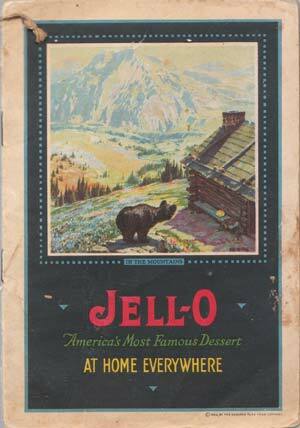 Jell-O’s version of America is romantic; but it is also a stereotype. Right: I think Catholicism may represent diversity in this image. Right: No trip around American is complete without romanticizing slavery. When I paged through this pamphlet, I came across a Jell-O technique I was unfamiliar with: The Whip. Essential, you whip Jell-o until it fluffs like whip cream. That’s essentially the way you make marshmallows: whip gelatin to a foam and then let it set. I was intrigued and decided to give it a whirl; I found this recipes for Glorified Rice, which seemed like it might be a little like rice pudding. I did as the recipe told me, including “salt to taste” despite the fact I had no idea how much salt I liked in my Jell-O. When I unmolded the dish and took a bite…the glories of rice pudding were the furthest from my mind. I cannot tell you how unappealing rice is when it’s floating in Jell-O. Not the creamy dream I had hoped for, the too sweet, too lemony Jell-o broke around dry, flavorless grains of rice. The combination was NOT delicious. However, I found another recipe in this pamphlet that sounded simple and satisfying: lemon Jell-o dissolved in 1/2 cup boiling water, then mixed with 1 1/2 cups ginger ale. This was a delight. It had a taste that reminded me of lemonheads, and felt like it was made of bubbles. The original recipes added walnuts, and maybe celery. I recommend keeping it simple. My version was a refreshing summertime treat. 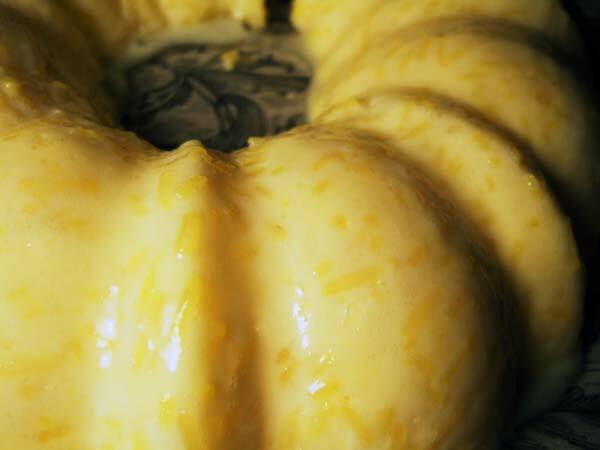 So you think that the Jell-O recipe has changed over the years? I mean, could it be that it worked better with things like rice in it before…or have our tastes changed that much? Also, my mother remembers my grandmother making Jell-O with all kinds of stuff in it…I’ll have to find out more for ya! I vaguely remember my grandmother making that carbonated Jell-o dish with the celery for special occasions. It may have had nuts in it too. I know it had more than just celery. I think it had crushed pineapple, also. It was sometimes served on a lettuce leaf as a salad. I do wonder if Jell-O used to have less sugar; in the couple savory recipes I’ve attempted this week (you’ll see soon)the Jell-O tasted bizarrely sweet. Like you can’t imagine the other of the recipe intended for the results to taste how they did. But in the case of the rice, it was more of a textural thing. The recipe calls specifically for cooked, dry rice. I think I expected rice pudding and got…well, dry rice suspended in Jell-O. Lisa– good memory. The original recipe suggests “nutmeats” and “finely cut assorted fruits” of the cook’s choosing. Do either of you remember liking the Jell-O recipes your grandmothers made? I think they mean rice boiled until there’s no water left (therefore “dry”) then cooled. 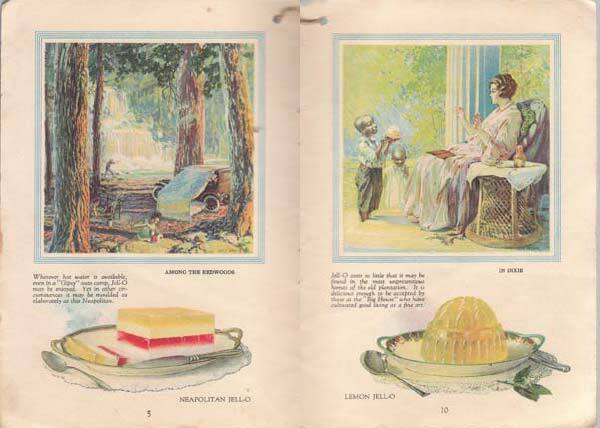 Well, I must admit, you are a brave soul whipping up these Jell-O delights from yesteryear. 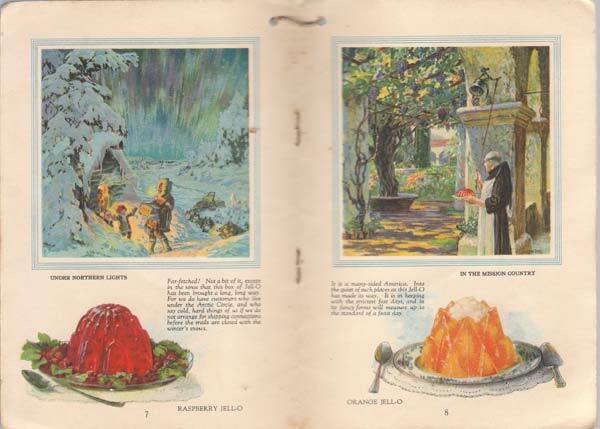 I have quite a few vintage Jell-O books and now that I think of it, I’ve never made one recipe. Shame on me!!! P.S. do you know who did the illustrations in this book. Was in Norman Rockwell? Not sure if you still want feedback on this, but my grandmother made a version of glorified rice that is a lot better than this. She got it from her grandmother, who died prior to the 30s. But in that one, you put sugar on the rice after you drain it, then the crushed pineapple, stir it up, and then pour whipping cream over it, along with vanilla. It’s a lot better. I make something similar to the second recipe. mix 1 cup of pop and 1 package of Jello. Stir in 1 cup of applesauce. Original recipe calls for lime Jello and lemon-lime pop. I think that’s too much lime. I still use Sprite or ginger ale, but I vary the flavour of Jello I use.